Mining and other extractive industries are driving human rights abuses and damaging the environment in the Amazon, say indigenous leaders. 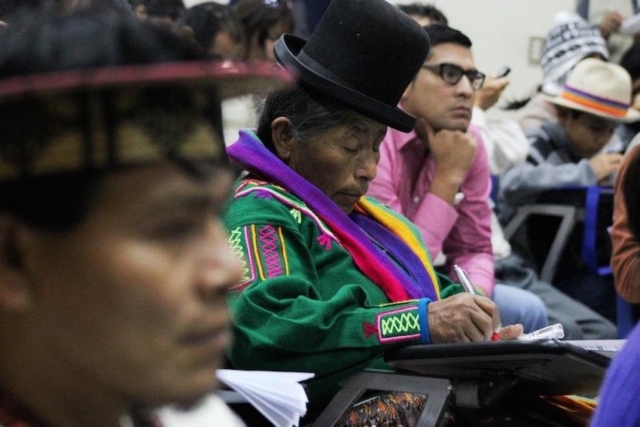 During meetings at the UN in New York 22 April to 1 May, community leaders supported by the Pan-Amazon Ecclesial network (REPAM) will raise the plight of their people. Caritas is a member of REPAM. REPAM was set up in 2015 to respond to the growing threats to indigenous people in the Amazon, supporting communities to advocate at the highest level. Members of Amazon basin indigenous communities in Munduruku and Yanomami (Brazil) and Kukama (Perú) will be present at the UN Permanent Forum of Indigenous Peoples. A member of the Yanomami community will tell how 92 percent of the community is contaminated with mercury. In the Munduruku community in Brazil a massive water project has been set up without respect to land boundaries. The Kukama community from Peru will highlight the dispossession of ancestral lands, construction of the Amazon hidrovia and the installation of oil wells without previous consultation, forced evictions and river drainage. The Mojeño Trinitario, Yucararé and T´siname indigenous communities also in Bolivia report deforestation and a large road building project on their ancestral lands. REPAM was set up in 2015 to respond to the growing threats to communities and to nature in the Amazon. The network sees the Latin American bishops conference, the Caritas family, religious congregations and various Catholic associations all working together in defence of the communities and the environment.